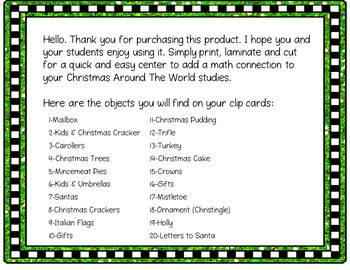 Christmas Around The World (England) theme Clip Cards for numbers 1-20 are great for math connections to your Christmas Around The World studies. This product is easy to assemble and easy for kids to use. Simply copy, laminate for extra sturdiness, and you have an instant Counting Center. 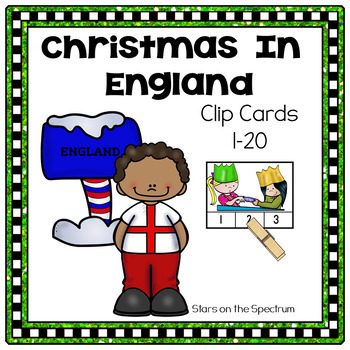 The clip cards are also great for partner or individual work too! You can make these clip cards self-checking by putting a sticker in the correct spot on the back. 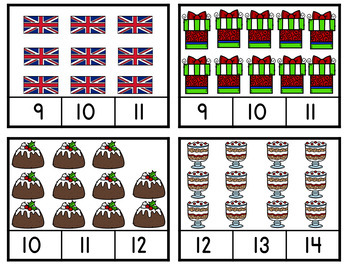 If your students need practice counting and matching sets of 1-20 objects these Christmas Around The World Clip Cards are perfect for you!